Time is not your friend when you're dean of the largest academic college at Indiana State University tasked with fully explaining that college's rich history and distinctive programs. Such was Dean John Murray's challenge at a special sesquicentennial Founders Day celebration on Jan. 27. 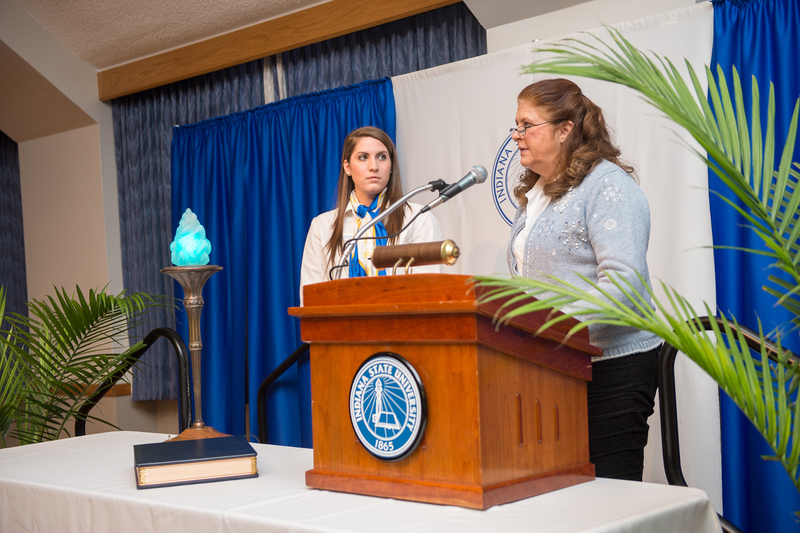 Co-sponsored by the Indiana State University Alumni Association, this year's observance of the traditional Book and Torch Ceremony was a tribute to the university's second oldest college, the College of Arts and Sciences. 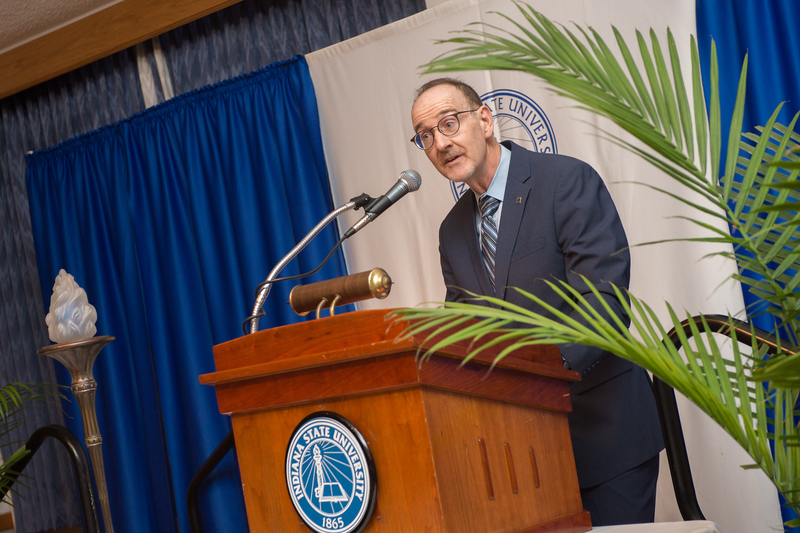 During the keynote address, Murray repeatedly stressed how he was just scratching the surface regarding how the college has evolved and the leaders who shepherded this progress. "Thousands of ISU alumni have majored in the disciplines in our college and have become successful citizens -- they are teachers, lawyers, scientists, musicians, artists, practitioners, clinicians and entrepreneurs," Murray said. "As we continue to celebrate ISU's sesquicentennial, I am so honored to highlight the centrality and the importance of this college." Founded in 1865, the Indiana State Normal School opened its doors to 23 future educators in 1870 and now serves more than 13,500 students as a comprehensive university with a 100-plus programs of study. Classes in the arts and sciences were then -- as it is now -- the "backbone" of the institution. "In the earliest years of the Indiana Normal School, courses and curriculum consisted of or was heavily influenced by liberal arts courses, science courses and arts courses," Murray said. "Almost from the beginning, a student's fluency in these disciplines was necessary for being a skilled teacher." Today, the College of Arts and Sciences provides the foundational studies program for all undergraduates, regardless of the major. "‘The role of a college education was to a means to prepare individuals to be well-rounded contributors to a democratic society,'" Murray said, reading from a 1963-1964 university bulletin. That message continues today with Liberal Education and America's Promise (LEAP), a national public advocacy and campus action initiative of the Association of American Colleges & Universities, which includes Indiana State. LEAP schools offer students a general education that is both broad and deep to prepare "them for worthy citizenship," Murray said. In addition to being a steady force on campus, the College of Arts and Sciences has been a champion of change. For instance, the social sciences division was highly diverse and forward-thinking in the 1950s and '60s. "It probably was the greatest diversity among its faculty on campus, and much of this can be traced back to the chair of that division, Dr. Cloyd Anthony," who hired many African-Americans, Asians and women, Murray said. The African and African-America Studies Program was created in 1972 (and later moved under the college's umbrella) to foster greater cultural understanding among future generations. "Very few programs like it existed in the United States at the time, and consequently, our program of African and African-American Studies is one of the longest-running programs like it in the U.S. The program is unique and reflected the desire of our institution to increase its complexity and diversity," Murray said. The humanities and music departments -- now the School of Music -- have also brought much prestige to Indiana State, as have several of the college's graduate programs. Murray credited strong leadership to the development of the college, deans who made "unique and distinct contributions," especially Effie Hunt (1974-86) and Judy Hample (86-94). "They were powerful, competent women who led the college and changed things in innovative and exciting ways," he said. Today, the College of Arts and Sciences has kept its stature in the state and beyond with the criminology department -- the largest major at the university with 900 students -- the languages department, Center for Genomic Advocacy and its recently approved masters of genetic counseling -- one of only two in the state -- and the nationally known Center for Bat Research, Outreach and Conservation. "Our present-day college has elements that resemble our earliest incarnations but have evolved over the years to meet the higher educational needs of the region," Murray said. "At this point in our history, we have grown to be ISU's largest academic college with 16 departments that span the fine arts, the social sciences, the sciences and mathematics and humanities. "It offers students academic experiences that will help them not only be a general education but also give the skills to help them get and succeed in their first job, their second and their third," he said. Student Jade Schitter, president of Sycamore Ambassadors, and Susan Amos, '76, board member of the ISU Alumni Association Board of Directors, presented the Book and Torch Ceremony. Student Government Association President Vernon Cheeks led the Cornerstone Creed. Last year, the Bayh College of Education hosted the Founders Day celebration as the oldest college at the university. Next year, the Scott College of Business will lead the Founders Day festivities, followed by the College of Technology in 2018 and the College of Health and Human Services in 2019. Photos: http://photos.indstate.edu/Events/Events-by-Year/2016/Founders-Day-2016/i-WtxQZ7j/0/X3/January%2027%2C%202016%20Founder%27s%20day%204360-X3.jpg -- College of Arts and Sciences Dean John Murray delivers the keynote address at Indiana State University's Founders Day celebration. http://photos.indstate.edu/Events/Events-by-Year/2016/Founders-Day-2016/i-J5fSZkD/0/X3/January%2027%2C%202016%20Founder%27s%20day%204403-X3.jpg -- Student Jade Schitter, president of Sycamore Ambassadors, and Susan Amos, '76, board member of the ISU Alumni Association Board of Directors, presented the Book and Torch Ceremony. Co-sponsored by the Indiana State University Alumni Association, this year's observance of the traditional Book and Torch Ceremony was a tribute to the College of Arts and Sciences.